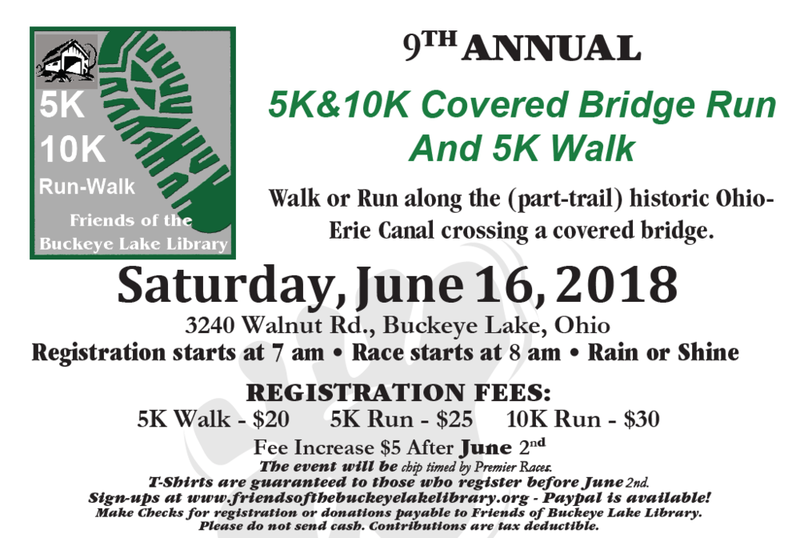 The Friends of the Buckeye Lake Library (a 501(c) (3) charitable organization) are planning the 9th Annual 5K/10K Covered Bridge Run and 5K Walk (Part Trail) chip timed to be held on June 16, 2018 in Buckeye Lake, Ohio to benefit the Buckeye Lake Library. We have seen it grow substantially as more and more residents of our community borrow books, materials and use our computers. While the library staff, books, materials and computers are provided by the Licking County Library System, all operating costs must be paid for separately by memberships in the Friends of the Library, numerous fundraisers and donations.